Hello my dear friends! Our Lore event is back up and running! Week 41 of this event is here!! Are you ready? You better be! 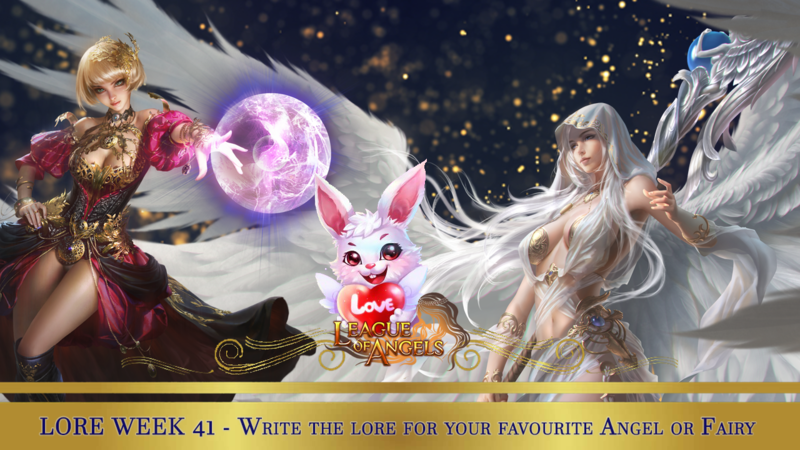 For this week's beautiful Lores we are looking for wonderful stories about Faries or Angels! Which one will you pick? Choose wisely! Same rules as always ! - There is no guarantee that the winning story will be introduced in game exactly as the poster made it or at all. The developers can modify, edit, add or remove parts or change what is needed to fit their final requirements. They are also free to decide if the most supported story is indeed worthy of being the chosen one, or it was a case of greedy alts. Also, more than one stories might be selected/combined. - Posts without IGN, Server and platform will NOT be taken in consideration anymore, so make sure you add them!!! NOTE: Mount & Heroes Evolves are counted in the Lore Book it does not have to be the base form. So you don't have to use the form that appears in the Lore strictly , but can use one of its evolves as well. The final decision and adjustments will be seen in game! Do not forget to provide your IGN,Server, Platform when you post your lore!!! This event will end in 1 week! Please try and make all the posts/threads that have to be reported, in Support Section!!!! Not even the evil criatures below dare to get near her. Without return to the shadows. Hop, step, jump! It's in your eyes! A feeling that you can't disguise. Hop, step, jump! A beating heart! Excited in its smallest part. Hop, step, jump! Those butterflies! Make me want to conquer skies. Hop, step, jump! It's such a joy! Like getting soft & fluffy toy. Hop, step, jump! Each day so sweet! Addiction that I cannot quit. Hop, step, jump! That smiling face! Giving my heart a crazy race. Hop, step, jump! Us holding hands! More than being only friends. Hop, step, jump! Let's fall in love! We've got a blessing from above. Hop, step, jump! This Valentine! I will be yours, you will be mine. With nostalgic silvery kisses and moonlit dreams. Taurus is the zodiac's second sign of the horoscope, and the legend says it is represented by the bull that drove Europe to Crete, and this bull finds even the disguise that Zeus chose. Later, Europe gave birth to three children: Minos, Sarpedon and Radamanthys, sons of Zeus. Eventually, Minos became king of Crete, and Pasiphae, his wife, gave him a son named Minotaur. Later, Minotaur was slaughtered by Tezeus in the Labyrinth, and as a sign of respect, the bull constellation was born. An Azure Dragon mastered and guarded a fabulous treasure in a castle also very well guarded by its subjects. Azure Dragon never left the treasure. The Dragon's people have placed a vast territory around the castle. The inhabitants of that territory, subjected to the Dragon, were constantly working to pay the Dragon collected by its people. From dawn to night, the locals trained in the field resigned and hopeless. Sometimes only one might see a mighty one who dared to face the Dragon. Then there was the sound of weapons at the castle. For a moment, the field workers around the Dragon Castle hoped for hope. But the hope was short-lived. Above the wall of the castle, near the window where the Dragon lived and where his treasure was, shortly after the weapon noise ceased, he came the Dragon's captain and announced the Dragon's victory. And life-and continues the same bitter taste. Only the Dragon's treasure grew day after day. The dragon grew greedy and his soldiers were gathering more and more tribulations.That is how they came to take a young shepherd even the whistle that was his companion in the loneliness in which he lived. And so his whistle came alongside the gold and jewels that formed the Dragon's treasure. Angry, the young man starts to make himself alone. He reaches the Dragon's castle, struggles with his men, overcomes them, penetrates into the castle. Rowing along, he gets past all the obstacles and gets to the Dragon and starts a fight with the Dragon. Like every time, field people stop for a moment and look forward to the verdict. Looking back behind the closed doors, we see how ... wonder: the young man defeats the Dragon. As soon as the Dragon was abducted, the captain of the castle soldiers opened the young door to the room where the Dragon's treasure was. A brilliant golden mountain makes the newly-conquered young man close to him. The captain tells him that from now on everything he sees belongs to him. The young man approached and, fascinated, leaned forward and stretched out his hands to embrace the gold he needed. Seeing this, the captain of the castle soldiers heads to the window, opens it and announces: "The Dragon has defeated!" The treasure was enchanted. Once the young man stretched his hands grabbing the gold of the treasure, his hands began to drain their claws of dragon. In fact, he did not always defeat the Dragon, but after the silence lay over the castle, the Dragon was the ruler of the treasure. An ever more cruel and greedy Dragon.And the young man, on whom the spell started the metamorphosis, gazed with glasses the gold that stretched before him. And so it appeared tangles, reptile and tail scales. It's just ... the chance makes his eye look at the edge of the golden mountain and his whistle. At that moment he remembered why he had come there. At that moment he left the gold and took his whistle. At that moment he noticed the jaws and scales. Realizing what monstrosity was about to happen to him, he departed from treasure. Moving away from the treasure, the metamorphosis ceases and his hands return to their original form. He left only taking the whistle for which he had come there. And so the tyranny is over! Ign...Tica..server ub85...gta. Please pay attention to the theme of this week's lore event. This week's theme is Angels and Faries. Azure Dragon is a mount, thus not matching this week's theme. As a reminder, please re-submit this lore in the next lore event that has mounts in the Lore theme. Thank you. aren't you, you puny lot? so why am I even talking to you weaklings? Go climb a tree, you imbeciles! And stay up there! Don't descend! Sorry, but we will not be accepting this. It is an exact copy and paste of another poem found here. The idea of this event is to make up your own poem use your imagination to create. Not copying and pasting other people's work for your lore. Because of this, you will not be eligible for any prizes for this event. After Hercules scared the Lion of Cithaeron, the lion went to set up a lair at Mount Helicon ravaging on the Thespian cattles. The King of Thespiae - King Thespius, offered his fifty daughters as a prize and Hercules hunted the lion for fifty days. During each night of the hunt, Hercules slept with forty-nine of the daughters. The fiftieth daughter who did not slept with him was punished and served as a priestess of a temple for Hercules. One of the daughters who slept with Hecules was Erato who bore him a son - Dynastes. This was all that has been known about Erato but there was much more that has been unknown to the historians and was never written. Erato fell in love with Hercules. She secretly hoped for Hercules to fall in love and marry her. She prayed eveyday that Cupid's arrow may pierce the heart of Hercules. Even the Goddess of Love - Aphrodite noticed her pure and undying love for Hercules. True to her name, Erato was a beauty to behold. She has captured the heart of countless heroes. Except her one true love - Hercules. Love cannot be taught nor influenced that even Aphrodite herself was powerless to help her. Erato remain true and and waited for her one great love until her last days. Once upon a time, there was a great magician who had a pet squirrel named Squill. He performed a lot of magic tricks with his pet squirrel as part of the performance. The people love all his tricks with Squill. Squill was a star in all of his magic shows. It just so happen that he had a rival magician who had dark plans for them. Squill witnessed how the bolt of their carriage was loosened by the evil man. His brain signalled "danger" and tried his best to convey this to his master. One of the wheels suddenly separated and it fell from a ravine. The magician died and Squill was barely alive. The poor squirrel was in agony. Squirrels from the forest heard Squill and echoed his cries. His laments reached the depths of the forest where the King of the Fairies happen to pass by. His heart went to Squill when he saw his condition. He looked into the eyes of this poor creature. The eyes were windows to the animal's core being and he then learned what happened. With the flick of his wand, Squill began to heal and much more. He was slowly turning into a magical being - a fairy ! A deck of magical card and a magic wand in a form of a cane was handed down to Squill. The King of the Fairies pick out of thin air a top hat and gave it to Squill while addressing him. "Go my Magician Squirrel and find justice for your master." This is how Squill the Magician Squirrel came to be. His magic tricks never fail to amaze even for the standards of his fellow magical beings in Fairyland. His shows are always full in attendance. Of course the admission is free. In the Angel Universe I'm only known as Kali, but before I became a war seraph on the continent of Grace, my full mortal name was Theresa Kali. I was a leader and only female warrior of a Seljuk Turkic tribe in 11th century Turkey. I've battled alongside great mortal warriors and brought many of them to their knees, I was very determined to help protect the motherland and its citizens from invaders. Unfortunately I wasn't prepared for the invasion of the legendary Genghis Khan and his army of Mongols, and I fell victim to the blade of a Samurai Sword. My soul transcended from the battlefield to Dragon's Nest, where I met Angel Boadicea. She taught me everything I needed to know about becoming a war angel and bestowed me with armor blessed by Persian goddess Artemis. And as I did in my mortal homeland of Turkey, I promise to protect the continent of Grace and its citizens from those who would do them harm. Athena enjoyed her peaceful life in the Divine Realm. But one day, she happened to look down into the Realm of Heroes. What she saw made her so mad that she instantly turned white. Some say that white means purity or innocence, but angels like Athena knew better. White was a combination of every other color: the strength of red, the intensity of yellow, the wisdom of blue, and so on. It was the most dangerous color of all. Below Athena, the Styx Guardian had raised hordes of dead from the ground with a dark spell. With his dark army, he was rampaging across the Realm of Heroes. Athena couldn’t bear to look at the destruction of the beautiful landscape any longer. She grabbed her Staff of Judgement and descended. Athena flared with righteous wrath as she descended from her clouds. It was said that her halo alone could be seen from hundreds of miles away. In one blow, she struck the Styx Guardian from his stallion and banished him into another dimension. Seeing that their leader was defeated, the skeletons fled back into the ground. Everybody gave three cheers to Athena. Athena helped everyone rebuild and recover from the war. In time, people built temples in her honor, and Athena became the angel of wisdom and war. Wielding her Staff of Judgement, which contains an eye that can see the entire realm and even other dimensions, Athena is as wise as she is powerful. She knows that war is only a last resort, not a solution. Using her strength and her wisdom, Athena kept peace in the Realm of Heroes. Thanks to her efforts, the Realm of Heroes entered into a Golden Age. With a swift downward swoop the earth shook and trembled on the impact of his weapon! Dust flew in every direction creating an awesome cloud of dust! Please pay attention to the Lore event theme. The lore event is about angels and faries, Heroes are not part of the theme for this week's lore event. Due to this, you will need to re-submit this lore for the next Lore event that has heroes in the theme. 2019-4-21 03:01 GMT+8 , Processed in 0.077601 second(s), 64 queries .